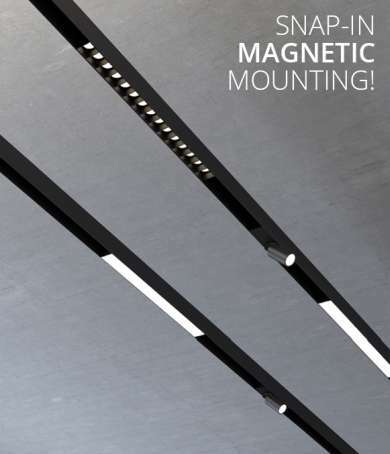 GlowSTX is an all new suspended linear LED lighting system with an arsenal of design features. GlowSTX is comprised of a miniature aluminum housing with a smooth satin white extruded acrylic lens. Each linear section is only 3/4″ wide by 2 1/4″ tall in cross-section and up to 8′ long in length. One system. Endless possibilities. 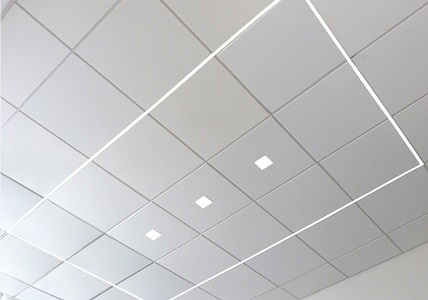 The Airelight Linear luminaire with Suspended Ceiling Connector allows for easy integration into drop ceiling T-Bar grid applications. Utilizing its ultra slim profile and light weight, the Airelight Linear SC 0.5 directly attaches to the T-Bar grid with integrated magnetic connector. 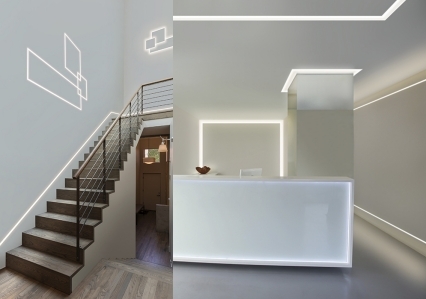 See more Airelight products and clever installations. Downlights with the TrimLock reflector system that ensures trim remains flush with ceiling plane. Also see the Video and PDF brochure. 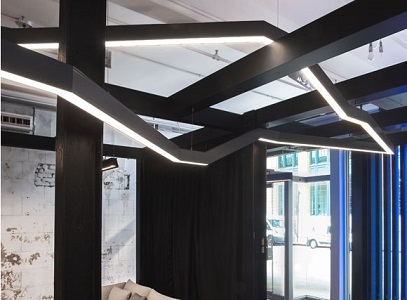 Coronet LED introduces Custom Elevations – upping their game when it comes to custom Linear lighting. Combine the elevation capability along with custom patterns, angles, lengths and colors, and the design possibilities are literally endless! 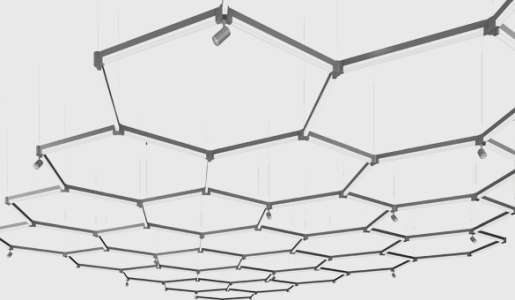 Currently available with the following Linear Pendant products: LS1 SERIES, LS2 SERIES, LS3 SERIES, LS4 SERIES, LS6 SERIES, RAY4 LED, RAY6 LED, PIER LED. 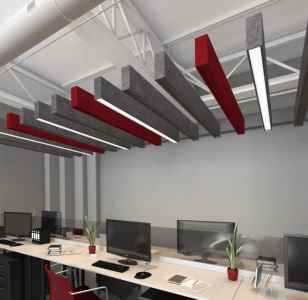 Superior acoustical control with integrated lighting comes with a wide selection of color options. The STFU is available using the LS1 & RUSH Series, surrounded by sound-dampening panels made from 99% recycled material. Lit and unlit baffles available with a .75 NRC rating. Easily Rearrange Components Within the Track! 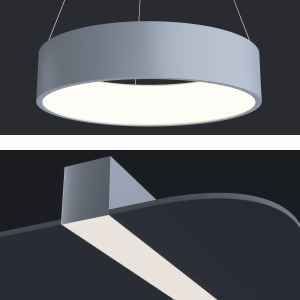 LOOP SERIES Suspended, architectural LED ‘ring’ provides uplight and downlight. Great for lobbies and modern office spaces. LSR3 SERIES For use in indoor applications where a small profile providing continuous light is required. 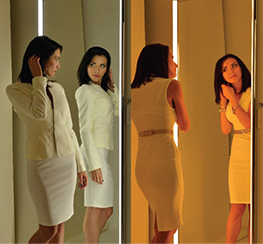 Tunable White technology offers a range of temperatures that mimic natural occurring light. Choose between a very warm 2000K that is similar to the ember of a candlelight and 5700K, a brighter, bluer light that mimics daylight. Tunable White LEDs can be synced to an astronomical clock that shifts from brighter, bluer light during the day to a warmer, amber glow during the evening. See how Tunable White technology works in this video. 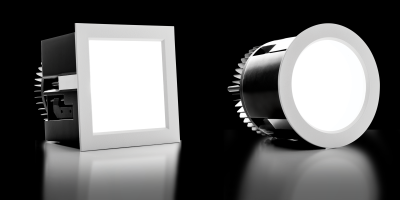 ELEMENT Reflections redefines dimmable LED recessed downlighting. 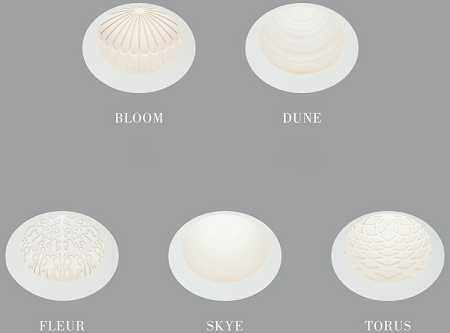 A choice of five distinctive domes, molded with exquisitely embossed design details, subtly accent architectural themes with glare–free LED general illumination while creating a soft ceiling glow. Check out this great introductory video. More than lighting: Business insight. 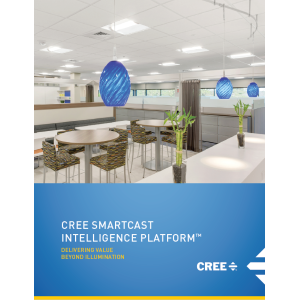 Cree SmartCast Technology delivers value beyond light to make businesses more profitable. Built on a foundation of world class simplicity and user experience, Cree is leading the industry into its next great transformation. Scroll down on the Product page to see almost unlimited options for the Reveal, Reveal Wall Wash, and TruLine solutions. Be sure to check out the installation and specification videos. Unprecedented low-glare illumination, exceptional energy efficiency. The IG Series parking garage fixture provides unmatched low-glare comfort and decreased LED source luminance to cast rich illumination that maximizes detail and defeats shadows. 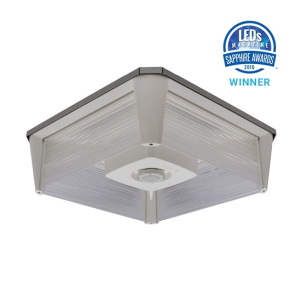 The IG Series delivers unprecedented low-glare illumination, exceptional energy efficiency and fast payback, redefining how you think about parking garage lighting. Be sure to check out the Product Video.